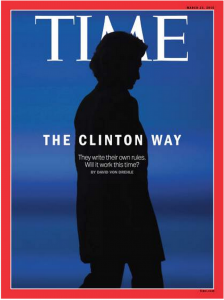 The new cover of Time Magazine will surely give Hillary an ulcer, if she doesn’t have one already. Candidates for president crave attention and magazine covers–but not like this. After a week that has put her on a bumpy downhill road and exposed her arrogant cockiness, I hope all the attention will scuttle her once-assured rise as the Democratic nominee. Haven’t read the article yet, but I hope it tells the truth about her and the scandals she is hoping to avoid. The LAST thing we need in this country is Hillary as the next president. Lord have mercy! We also need to worry about Elizabeth Warren. She’s every bit as dangerous as Hillster. I am a bit surprised at Time. They actually had a great article on our next President, Jeb Bush! Perhaps maybe even they are tired of the liberal prater or maybe they are part of a bigger plot!